We are both Billings, MT natives with nonacademic backgrounds and over 40 years each in differing established art careers. Greg has been a full time studio potter influenced by Montana’s deep legacy of studio clay. Nancy pursued a career in graphic arts and illustration as a freelance artist and also as corporate art director. She ended her graphics job of 20 years in 2007 to pursue her painting and collaborative ceramics with Greg from their two home studios. We each have met our match in a shared love of the natural world, a similar critical eye, and an uncommon capacity for hard work throughout lifetimes of making. Our collaborative work brings together the best of both worlds, while maintaining a rich expression of distinct voices. It’s the result of an intimacy and a trust wherein we “obey a third body that they share in common” (Robert Bly). The last 22 years together has produced an innovative blend and style in functional porcelain which best reveals the nuances of Nancy’s sophisticated eye as designer and decorator. 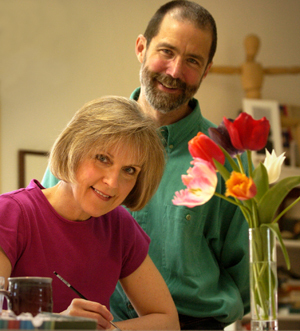 Nancy’s own ideas, skills, and aesthetics are combining into her singular, accomplished style in clay supported by Greg’s years of studio management. We were recognized art standouts in the same high school art class (West High ‘69). We’ve been together for 22 years after reconnecting at our 20th class reunion. We have both lived other places and chose to return to our roots in Billings because of strong connections to landscape, seasons, and aging parents (now deceased). Though we are a couple, married in 2004, we didn’t parent together and have no children at home. We share gardening, healthy cooking, hiking, kayaking and yoga/meditation practices. The clay studio is a new 1,000 sq ft building we built in the backyard of a modest 50’s house (980 sq ft) we remodeled with an added second story painting studio (700 sq ft). A 42 cubic foot, old Alfred style downdraft kiln is 45 years old and sits under a roof in the back yard.